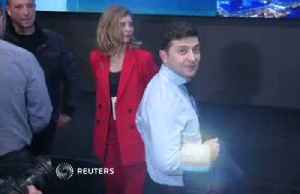 Watch VideoUkraine has elected a new president. 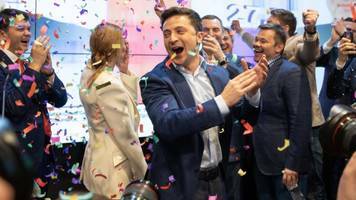 Comedian Volodymyr Zelenskiy won Ukraine's runoff election by a landslide. 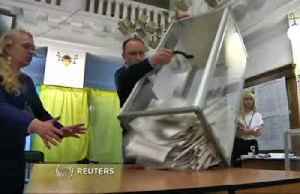 With nearly all of the ballots counted, he garnered 73 percent of the.. Earmarked for Russia's Black Sea Fleet, the frigates fell victim to sanctions imposed by Ukraine in 2014 after Russia annexed the Crimean peninsula, prompting Kiev to ban the sale of the Ukrainian-made..
By Sabine Siebold MOSCOW/KIEV (Reuters) - German Foreign Minister Heiko Maas on Friday urged both Russia and Ukraine to de-escalate the conflict in eastern Ukraine and said France and Germany were..
Russia plans to build a new missile early-warning radar station in Crimea next year, the Interfax news agency reported on Thursday, citing a Crimean security source. Russia seized three Ukrainian navy ships and their crews on Sunday near the Crimean peninsula, which Moscow annexed in 2014, over what it said was their illegal entry into Russian waters - a charge..
Russia will deploy new S-400 surface-to-air missile systems on the Crimean peninsula soon, the Interfax news agency cited the Russian defence ministry as saying on Wednesday. Russia seized three Ukrainian ships after firing on them near the annexed Crimean peninsula on Sunday, threatening a dangerous escalation in the crisis between the two countries and prompting Kiev to..
Three Ukrainian naval vessels seized by Russia off the coast of Russia-annexed Crimea on Sunday are being held at the Black Sea peninsula's port of Kerch, a Reuters witness said on Monday. [Ukraine], Nov 26(ANI): The Ukrainian navy on Sunday accused the Russian army of firing on and capturing three of its ships near the Kerch Strait, a narrow sea passage close to the Crimean peninsula. Hundreds of residents in the Crimean port city of Kerch commemorated on Friday the victims of a college mass shooting in which an armed teenager killed 20 people, mostly his fellow pupils, and injured..
Eighteen people were killed and dozens injured at a college in the Black Sea region of Crimea on Wednesday when at least one attacker set off a bomb in the cafeteria and went through the building.. The head of a Crimean college said on Wednesday that unknown gunmen had burst into the building, let off explosives, and started shooting anyone they saw. A blast at a college in the Crimean port city of Kerch killed 10 people and injured dozens on Wednesday, Russian news agencies reported, citing sources. The European Union has imposed asset freezes on six Russian firms for their involvement in the construction of a new road-and-rail bridge linking Russia to the annexed Crimean peninsula, which the bloc.. US President Donald Trump's revocation of support for a joint communique with other leaders at the G7 summit was "sobering and a little depressing," German Chancellor Angela Merkel said today. "It's..
Russian President Vladimir Putin says Western sanctions against Russia haven't worked and both Moscow and the West would benefit from lifting them. 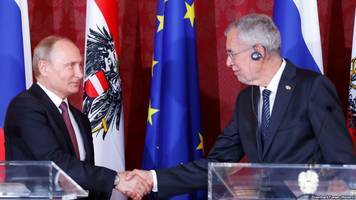 Putin, speaking on a visit to Austria today, said the..
Poland's prime minister today called a planned Russian gas pipeline, Nord Stream 2, a "new hybrid weapon" and says Moscow wants to use it to undermine NATO and the European Union. Mateusz Morawiecki..
A global coalition set up a year ago to fight epidemics has struck a $25 million deal with two U.S. biotech companies to accelerate work on a vaccine against the brain-damaging Nipah virus that has..
By Gleb Stolyarov THE KERCH STRAIT (Reuters) - Russian President Vladimir Putin, driving a truck, unveiled the auto section of a new road-and-rail bridge linking Russia to the annexed Crimean peninsula..
MOSCOW (Reuters) - Russian President Vladimir Putin said on Tuesday he was confident people would love the bridge to the Crimean peninsula, annexed by Moscow from Ukraine in 2014, after driving over it.. The swollen Seine peaked on Monday at more than four metres above its normal level, leaving a lengthy mop-up job for Parisians after days of rising waters that have put the soggy city on alert. The.. The swollen Seine rose even higher on Sunday, keeping Paris on alert, though forecasters said the flooding should peak by the end of the day. The river had risen 11 cm (4.3 inches) in 24 hours by.. The rise of China, behaviour of the US on world platform, challenge of terrorism, and the implication of non-market economics were four major disruptions at the global level, Foreign Secretary S..
MOSCOW (Reuters) - Russia deployed a new division of S-400 surface-to-air missiles in Crimea on Saturday, Russian news agencies reported, in an escalation of military tensions on the Crimean peninsula. At least 14 people died in southern Russia early today after a bus carrying construction workers veered off a pier and plunged into the Black Sea, officials said. 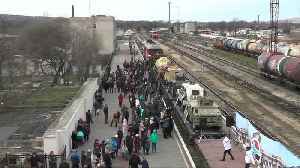 The bus was carrying people from..
Germany has warned Russia that breaches of sanctions including the relocation to Crimea of four gas turbines delivered to Russia by Siemens are straining political relations between the two countries,.. The Kremlin said on Friday it did not want to make any comment on a decision by Germany's Siemens to halt deliveries of power equipment to Russian state-controlled customers after a Crimean sanctions..
President Donald Trump said on Thursday the United States had demonstrated its commitment to NATO's defense through words and actions, and called on Russia to end its "destabilizing" action in.. The U.S. government on Tuesday sanctioned 38 individuals and organisations over Russia's actions in Ukraine, the U.S. Treasury Department said in a statement, reaffirming Washington's commitment to.. The European Union has extended sanctions against Russia for a year over its annexation of Ukraine's Crimean Peninsula in 2014. EU Foreign Ministers said in a statement today that the 28-nation bloc..
Russia has disclosed for the first time it has been looking to install equipment made by German firm Siemens in two new power plants in Crimea, a project that has been beset with difficulties because..
By Matthew Ponsford LONDON, May 26 (Thomson Reuters Foundation) - A Crimean lawyer who was jailed earlier this year by Russian authorities vowed to continue his work to bring global attention to..
A cargo ship heading from Russia to Turkey sunk off the coast of Crimea early on Wednesday morning and 11 of the crew are missing, Crimea's emergency situations ministry said.